LIFXcl has been updated to reflect user feedback. The color command has been reworked. It will now either take H(0-360) S(0-100) B(0-100) or #AARRGGBB. check the Readme for more information. LIFXtend has been adjusted a little bit to make it easy to see the H S B value and then use it directly in LIFXcl. NOTE: You will have to adjust your LIFXcl scripts to adjust them to the new commands. 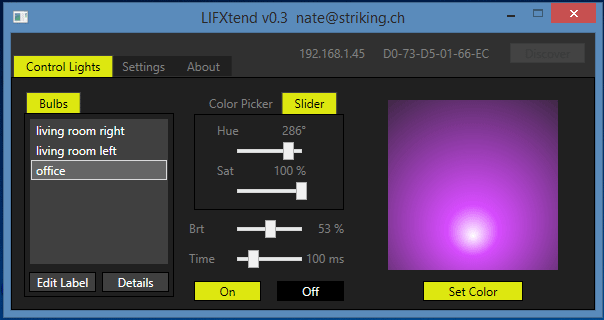 Download: LIFXtend032.zip Password as always LIFX.